Solar PV in Washington D.C. Solar Training Resource for Washington, D.C. 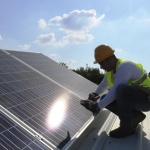 The solar industry in D.C. is growing with a total of over 15 megawatts of installed solar and over 120 solar companies across the state, powering over 2,200 homes and employing over 900 solar professionals. The costs of solar continues to drop nationally by 12% over 2013, and over 45% in the U.S. since 2010, and the costs continue to drop with each year, making solar an excellent, ground-floor market, and investment as a career. For a professional installer or sales rep looking to get into the industry, there is plenty of growth opportunity in your state. To learn more about solar companies and solar installations in Washington D.C., please visit the Solar Energy Industry Association’s website, www.seia.org/state-solar-policy.